Both are pretty interesting and innovative and whichever one you might like more it doesn’t really matter as we’re showing you our hands-on videos with both, in case you’ve missed our in-depth coverage of Samsung’s UNPACKED event yesterday. The Samsung Galaxy Note 4 packs an improved 5.7″ display – the resolution is higher at 1440 x 2560px and the resulting sharpness is off the charts at 515ppi. The chipset is either the latest Exynos 5433 by Samsung or the Snapdragon 805 from Qualcomm, finally 3GB of RAM round off the processing power. The camera is an OIS 16MP snapper capable of 2160p videos. 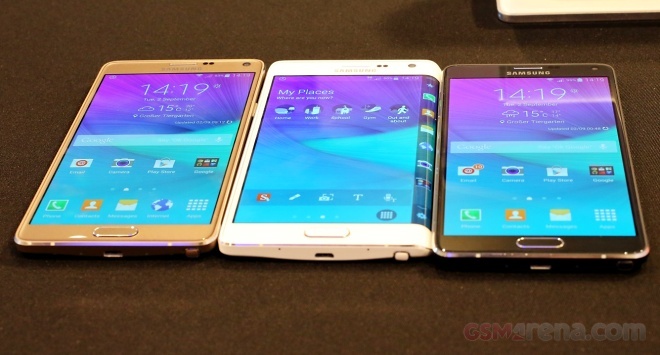 Check out our video hands-on with the Samsung Galaxy Note 4 below. Samsung really dug into its innovation kit with the Galaxy Note Edge – it’s a big leap away from the nomenclature of mobile tech. Built around a similar hardware package with the same camera and chipset options the display is different. It’s a 5.6″ unit of 1600 x 2560px resolution and features a curved edge on the right side that’s populated by an extra 160px and has various use cases. When locked, a swipe on this part of the screen will reveal the date, time and missed notifications. The main panel remains dark, only the additional 160px-wide strip will light up. While you are on the lockscreen, you can use the additional strip for various purposes such as displaying stocks, weather, shortcuts (incl. flashlight), plus it can display a ruler. It remains to be seen if Samsung’s Galaxy Note Edge will be a headliner or just one of those quirky devices that wow us at an event but fail to make a mark on users. But if Samsung’s work on this product is any indication it may end up being much more than just another gimmick.